Donated by the Fox Chase Development Corporation, two entrance lots, totaling 2.0 acres, serve as a buffer to the neighborhood and provide a green view for motorists passing on the heavily traveled Hitchcock parkway. These heavily wooded lots provide a connection to riding trails and access via conservation easements to the 2,100-acre Hitchcock Woods preserve. 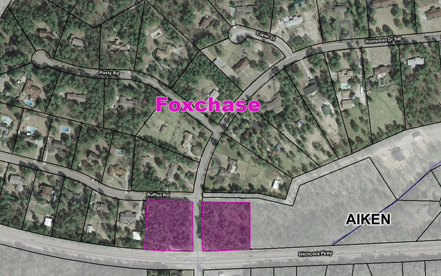 Aerial photo showing lands protected by ALC in the Fox Chase subdivision in Aiken.